Sir Francis Bacon, who some people think wrote all of Shakespeare’s plays, said that “Friendship doubles joys and cuts grief in half.” I think that’s true of bacon itself. It’s a fun food that (served in a wide variety of ways) does indeed double joy and cut grief in half. For many, it is an occasional indulgence, only eaten at restaurants! Bacon has a unique smoky, salty, and sometimes sweet flavor all rolled into one strip. The high fat content makes it very crispy when you cook it. It can be eaten on its own or crumbled up and used as a garnish on lots of different types of savory dishes. You can cook bacon in the oven, in a fry pan or in the microwave. I recommend the microwave approach, because it’s quick and easy, and there’s virtually no clean up. 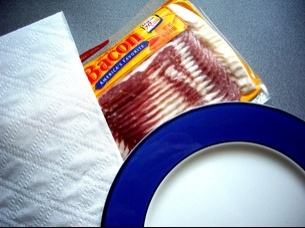 To cook bacon in the microwave you will need a microwave safe dish and three paper towels. 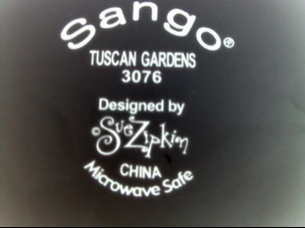 It will usually say on the back of the plate, in really small print, if you can use it in a microwave. Lay 2 paper towels on the plate. 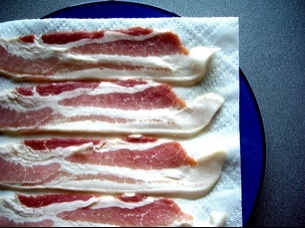 Spread the bacon out in a single layer not overlapping on the dish. Now lay another paper towel over the top. Depending on your microwave, this amount of bacon should take about 4-6 minutes to get nice and crispy. 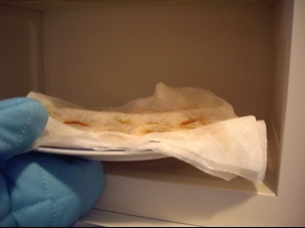 Using pot holders, very carefully remove the dish from the microwave. Be careful! The dish itself will be very hot. The paper towels will have absorbed all the bacon fat. With some tongs, put the bacon on a serving dish. Now just throw away the paper towels. It’s just that simple! Your bacon is nice and crispy and there is very little clean-up! 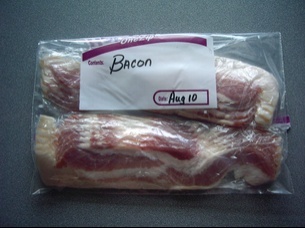 If you have uncooked bacon left over, the remaining package can be wrapped in plastic wrap and stored for up to one week in the refrigerator. I like to divide the remaining bacon into two packets and wrap it in plastic. Then you can freeze it. Be sure to date the package. It should be used within two months. Remember food doesn’t last forever in the freezer. If, later on, you only want one serving of bacon you can take the packet out of the freezer and zap it in the microwave for about one minute. Then, remove it from its packaging and cook it as described above. 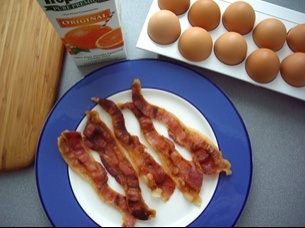 Bacon can be used as a topping to salads and baked potatoes, or as a perfect side dish to any breakfast or brunch menu. Kathy, I really appreciate the freezer storage instructions. I’m not that “freezer-savvy,” and I wind up with a lot of freezer burn because I’m clearly leaving food in there longer than it wants. Thank you! When I tried to cook bacon on a plate, it didn’t cook correctly. So, I just use the paper towels. Also, my mom has always told me to cook it for 1 minute per piece. I guess that could be valuable if you only want to cook 1-2 pieces. Imagine cooking one piece for 4 minutes! Wow! Talk about crispy bacon! Thanks Claire for bringing up timing. You are right, about 1 minute/strip. 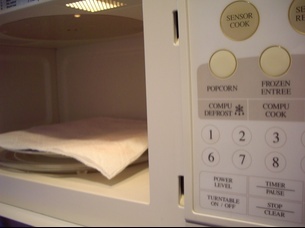 But each microwave is different, so that number is a bit different depending on how powerful your microwave is. My wife and I don’t have kids, and I *hate* stale bacon. Since there’s only two of us, I had to be a little creative when it comes to food storage. Here’s a tip I learned about storing bacon: when you open your package of bacon, roll each slice individually. 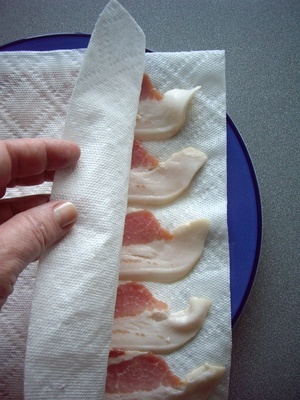 Place all of your individual bacon rolls onto a piece of wax or parchment paper on a cookie sheet. When it is frozen, place your bacon rolls into a zip-loc bag. Just pull a couple of bacon rolls out of the freezer into a small baggie the night before you want fried bacon and leave them in the refrigerator overnight. If you get an urgent bacon craving, or forget to thaw your bacon, throw a couple of rolls in the microwave for a few seconds until you can unroll them. Then fry, and enjoy! Thanks Stephen for the great tip! Freezing individual slices makes a lot of sense. If you want just a small amount for garnish. or a breakfast splurge this is surly the way to go! My granddad showed me another great way to store bacon in the freezer. First, he lines a rectangular storage container with plastic wrap. Then he alternates layers of bacon strips (side-by-side and not touching) and plastic wrap, until all the bacon is in the container. This way, he can take the flat bacon strips straight from the freezer to the pan. The layers of plastic wrap between the bacon layers keep the bacon from sticking together. This works with sausage patties and pre-made pancakes, too! Hi Danielle, thanks for sharing your granddad’s great tip! I’ll bet he was a wonderful cook! I’ve never been a big fan of microwaved bacon, but I’ve done a lot of it to satisfy my ex-wife’s addiction to the stuff. Between her and the cats, they could lay waste to a pound of the stuff. To me, it was always a little too tough cooked that way. On the plus side, as you’ve pointed out, it’s fast and there’s little clean-up. I don’t eat bacon too often anymore, but when I decide I have to have some, I’ll go through the trouble of frying up a whole pound, and stashing the unused strips in a Rubbermaid-type container in the fridge for later use. Heating it up for breakfast only takes seconds, and you can also use it for garnishes and sandwiches. Doing it that way means there’s only one mess to clean up, yet you get to have bacon a number of times for no trouble at all. Cooked bacon also freezes beautifully! I haven’t had much luck cooking bacon with paper towel. I find the towel is saturated with fat and it makes a mess of the carousel. I am wondering if it’s better to cook bacon on one of those bacon dishes you buy at the store. They elevate the bacon so the fat drips off. Actually I’m going to try one tomorrow and do a few tests. What do you think? BTW I enjoy this site. Stumbled up it I believe. Hi Robert, when I use a microwave-safe dinner plate with two paper towels on the bottom and one on the top, it leaves the carousel dish without a single drop of bacon fat. Are you cooking the bacon directly on top of the carousel? If so I can understand why that would leave a big mess to clean up! Plus most manufacturers do not recommend cooking directly on the carousel. When I make bacon I generally use a ridged bacon dish with one paper towel on top so the microwave does not get splattered, and yes the fat just drips right off. It works perfectly! But I usually do not like to recommend buying single use kitchen items for the beginner cook. I’ve never heard of “side” bacon, and in searching around, I’m not finding any recipes for it, either. Pig sides are mostly ribs until you get to the loins, brisket, etc. Maybe you’re thinking of back bacon, or as we call it in the US, Canadian bacon or really bad ham? If you’re thinking of back bacon, I think most people fry it, but it’s a pretty tough cut of meat and frying doesn’t do much for it other than get it hot. It has a good flavor, but the texture leaves a lot to be desired. I did find a recipe for “fresh” bacon, but it’s from the belly. I suspect it would work well for back bacon too, as it calls for braising and that’s a good way to cook tougher grades. You can check that out here. KGW you are the BEST! I can’t thank you enough for all the valuable information you share with us here at startcooking.com. Your comments are always well researched and spot on! The entire team here at startcooking.com values your knowledge and your friendship! I think I am so naive as I just learned right now through this post that you can actually cook microwave in the bacon. I do it the traditional way since my kids love bacon for breakfast. I will try to cook bacon this way tomorrow…thanks for this info, this is huge for me. Hi, I just tried this with 3 strips of bacon, fairly large pieces, lean meat, not a lot of fat. (No really big distinctive “thick line” of fat. I tried three minutes, but when I took the bacon out of the microwave the paper towels were stuck, or actually more like embedded in the bacon, impossible to remove so I had to throw it away. What went wrong? Could it be because the bacon didn’t have enough fat and the paper towels were too absorbent? I would really like to use this technique because it saves time when I am in a hurry, I don’t have 15-20 minutes to fry it in a pan most of the time. The sticking does indeed have to do with the fat content of the bacon. 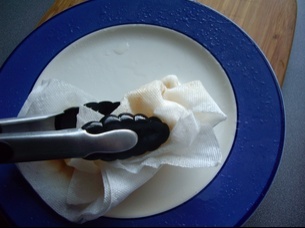 Once the bacon is cooked, using a pair of tongs (as shown in the video) , remove the bacon from the paper towel immediately! Do not allow it to cool or it will totally stick to the paper towel. Given you are using extremely lean bacon, try putting the bacon directly on the plate with just one paper towel on the top of the bacon. This is the best thing ever for a college student. Hi, it’s me again. I tried this again a week back but instead of using paper towels I just used some baking sheet to cover the bacon, (used the same extremely lean type) and it worked great. Also you can use the baking sheet many times if you are cooking more bacon than will fit on one plate. So if you are trying to microwave really lean bacon, using baking paper could be a better option. Also on the issue of paper towels, I think the best type to use is the stronger and less absorbing type, a “puffy” paper towel (made from recycled paper?) is probably more likely to end up being one with the bacon than a more fibrous “papery” type. Hmmmm, given baking sheets are usually made of metal, I’m amazed that you did not have sparks flying as well! Covering the bacon helps to cook the bacon and also avoid serious splattering. 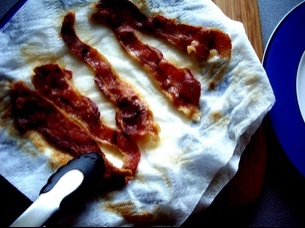 Plastic wrap would not work as it would then steam the bacon and make it very chewy instead of crispy – hence the paper towels. I agree with you about not using too puffy paper towels which the bacon might end up sticking to. I still can’t figure out what kind of baking sheet you might be referring to! The “sheets” I used were not made out of aluminum, that would have sparked and caught fire for sure. I’m sorry if I wasn’t clear. What I used is called, “parchment paper” (http://en.wikipedia.org/wiki/Parchment_paper_(baking)), it is not wax paper. It’s often used when baking small pieces of pastry in a conventional oven. I’m thinking I confused you by using the word “sheets”? I only recommend this method if you are having trouble with the paper towel method. Thanks for the clarification. Parchment paper is a must for every kitchen. Thanks for the tip!